The ever-growing number of fluorinated compounds in medicinal and agrochemical applications has led to a remarkable positive emulation in research. The last few years have been the witness of several advances in the search of more effective and user-friendlier methods for the introduction of fluorine as substituent or of fluorinated groups on various structures. 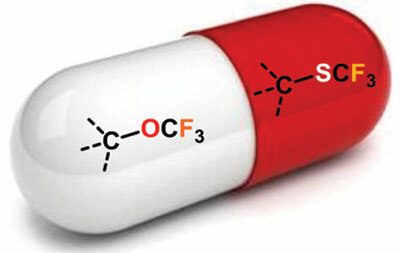 In particular, the synthesis of trifluoromethyl ethers and thioethers is receiving increasing attention due to the peculiar properties of the OCF3 and SCF3 groups. This review will cover the different methods for the preparation of trifluoromethyl ethers and thioethers, and will emphasize on the most recent developments, including the use of catalytic methods or of methodologies for trifluoromethylation or trifluoromethanesulfanylation. Fluorine, trifluoromethoxylation, trifluoromethylthiolation, drug discovery, ethers, thioethers, catalysis. CNRS-Universite de Strasbourg, UMR7509, SynCat, ECPM, 25 Rue Becquerel, 67087 Strasbourg Cedex 02, France.